For more information on UST Class A/B operator training in New Mexico, visit the New Mexico Environment Department’s Petroleum Storage Tank Bureau website. PASS' Class C Operator Training in New Mexico is approved thru the New Mexico Environment Department - Petroleum Storage Tank Bureau. Registration: Owners/operators must register all storage tanks unless those tanks have previously been registered and the information contained in the registration is still accurate. For new installations, the registration form (instructions for completing the registration form) and the applicable fee must be submitted to the PSTB prior to putting the tank into service. When ownership of a tank changes, when a new tank is placed into service, or when any previously submitted information changes, a new registration form must be submitted. Tank Fee: Owners/operators must pay the annual tank fee on July 1 for each fiscal year (July 1 through June 30) or portion of a year that a tank is in use. If July 1 falls on a Saturday or Sunday, payment will be due the following Monday. The annual fee is $100 per tank. Registration Certificate: Upon submission of a complete registration form and payment of the annual fee, the PSTB will issue a registration certificate, which must be displayed at the storage tank facility at all times. An initial registration certificate will expire on the next succeeding June 30, regardless of its date of issuance. Renewal registration certificates will expire on June 30 of each year. Owners/operators must report any suspected or confirmed releases to the PSTB within 24 hours. 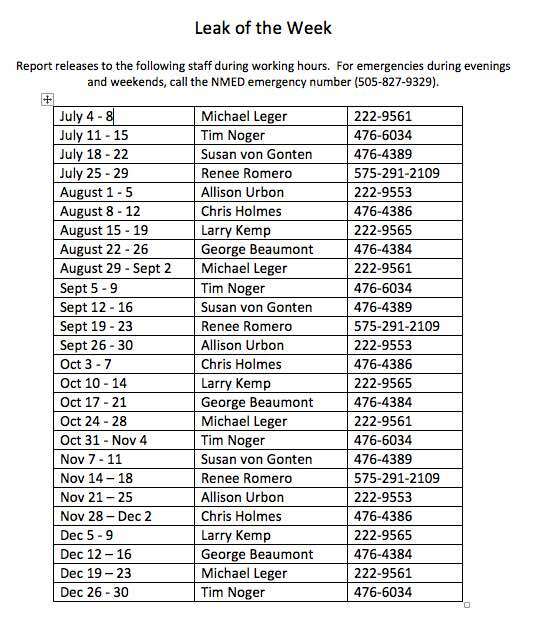 To report a spill, overfill, or suspected or confirmed release, owners/operators should call the appropriate PSTB staff person (see table provided here) during regular business hours or the NMED emergency number (505-827-9329) during evenings and weekends. Prior to contacting the PSTB, owners/operators should complete an Incident Report. The PSTB has prepared a Reporting Suspected and Confirmed Releases brochure, which owners/operators may refer to for more information. New Mexico follows the federal financial responsibility coverage amounts found in 40 CFR §280.93 (scroll to page 77 of 119 in the pdf document). Owners/operators may use any of the following mechanisms to demonstrate financial responsibility. Class A or Class B operators responsible for USTs must perform a monthly inspection of each storage tank system and record the results on the appropriate checklist. The Class A or Class B operator must provide the owner/operator with a copy of each completed checklist and inform the owner/operator of any conditions that may require follow-up actions. Owners/operators must maintain copies of all inspection checklists and attachments for the previous twelve months at the facility or at an approved off-site location. If the Petroleum Storage Tank Bureau (PSTB) determines that a UST or UST system is out of compliance with state or federal storage tank regulations, it may classify that system as ineligible for delivery, deposit, or acceptance of product. New Mexico regulations describe two different categories of ineligibility: mandatory and discretionary. Mandatory Ineligibility: If required spill prevention, overfill protection, leak detection, and/or corrosion protection equipment is not installed at every storage tank at the facility, the PSTB will classify the tank(s) as mandatorily ineligible for delivery, deposit, or acceptance of product. In cases of mandatory ineligibility, the PSTB will issue to the owner/operator a notice of intent to place a red tag on the tank(s) identifying the tank(s) as ineligible for delivery, deposit, or acceptance of product. The notice of intent will list the identified violations and provide the owner/operator 30 days from the date of the notice to correct the violations. If the classification would jeopardize the availability of, or access to, motor fuel in a rural and remote area, the PSTB will defer classification for up to 180 days. Discretionary Ineligibility: If improper operation or maintenance of required spill prevention, overfill prevention, leak detection, or corrosion protection equipment, or operation of the storage tank or facility in a manner that creates an imminent threat to public health and the environment is discovered at a facility, the PSTB may classify a storage tank as ineligible for delivery, deposit, or acceptance of product. In cases of discretionary ineligibility, the PSTB will first issue a notice of violation listing the identified violations and providing the owner/operator 30 days from the date of the notice to correct the violations. If the owner/operator fails to correct the violations within 30 days, the PSTB will issue a notice of deficiency re-stating the violations and providing the owner/operator an additional 30 days from the date of the notice to correct the violations. If the owner/operator fails to correct the violations within 30 days, the PSTB will issue a notice of intent to red tag re-stating the violations and providing the owner/operator an additional 30 days from the date of the notice to correct the violations. The PSTB will also add the facility to the list of ineligible facilities on its website. In order for a red-tagged tank or facility to be reclassified as eligible for delivery, deposit, or acceptance of product, the owner/operator must provide a written statement of compliance to the PSTB and inspector that the violations have been corrected. The PSTB will then confirm that the violations have been corrected, document the level of product in each tank, remove each red tag and, within three business days, remove the facility from its list of ineligible facilities. For Temporary and Permanent Closure you must complete the 30 Day Notification Form for Change In Service-Return to Service-Temporary Closure-Permanent Closure form. See the Closure Requirements for Underground Storage Tank Systems 10-19-2016.pdf for more detailed instructions regarding temporary and permanent closure.